Roadsides, railroads, fields, and other disturbed places. Native of Europe and Asia and first collected in 1910 in Washtenaw Co. See remarks under B. squarrosus. 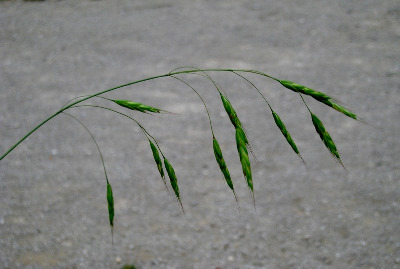 This is sometimes included within Bromus arvensis L.
MICHIGAN FLORA ONLINE. A. A. Reznicek, E. G. Voss, & B. S. Walters. February 2011. University of Michigan. Web. April 20, 2019. https://michiganflora.net/species.aspx?id=2034.